§ You want to look like yourself on your wedding day, so don't pick an over-the-top gown and a sweeping updo if you're usually a minimalist when it comes to clothing, hair, and makeup. You do, after all, want the groom to recognize the person walking down the aisle. When you’re headed down the aisle, your surroundings can shape your wardrobe. § The mood: If you’re getting hitched at city hall, you may want to rethink that seven-foot cathedral train. Similarly, a simple slip dress may not be the most appropriate choice if you’re having a black-tie fete at reception hall. § The lay of the land: Are you going to have your reception in an area complete with dust, dirt, and sand flooring? Then steer clear of floor-sweeping lace, which will act as a magnet for those brown bits. And a garden wedding can turn a long train from white to grass green before the photos have even been taken. 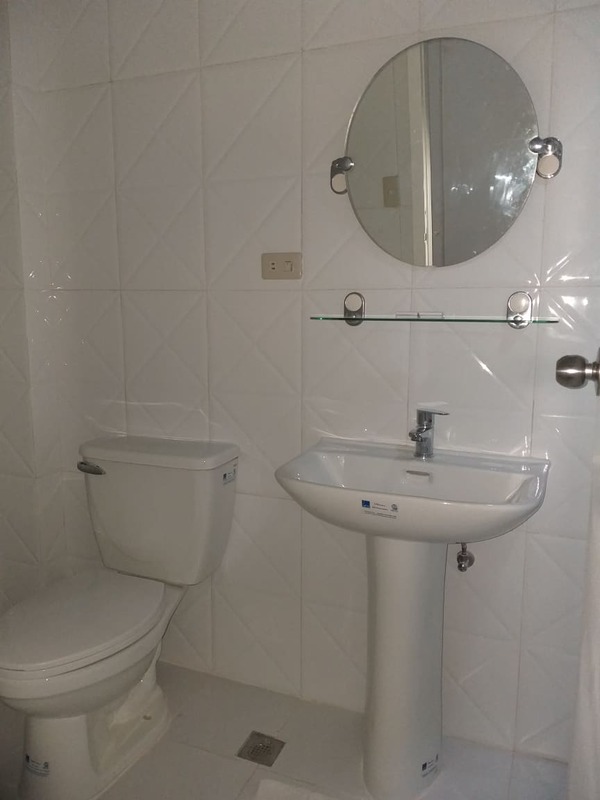 § The temperature: In Davao, the temperature averages in the 30's and the humidity is high, you’ll want to wear a fabric like cotton eyelet that won’t wilt in the humidity. 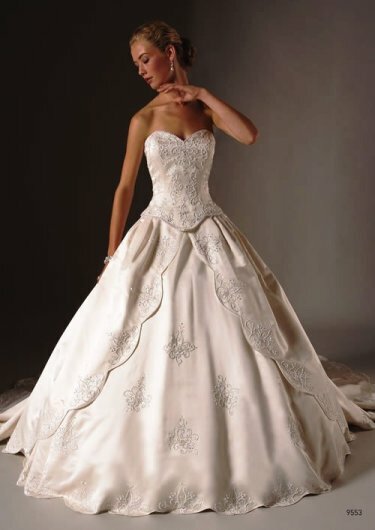 Meanwhile, if you know that you'll be protected with air conditioned environment then you'll want a wedding dress with a little heft to it, perhaps in satin or silk. Do you want to see "candid brides"? Take a peek at the recent wedding events that just happened at Linmarr. A wedding pictorial gallery you don't want to miss! Featuring thousands of pictures to inspire you (please allow time to load). Be realistic. Don’t try on dresses that are way out of your budget. You certainly don’t want to fall head over heels for a dress that’s simply not an option. § If you are at the high end of the market: You can pick every element of your dress (a strapless bodice, an A-line skirt) with a couturier and a one-of-a-kind pattern will be created based on your exact measurements. Or you may want to purchase an existing style from a well-known designer label. The dresses in this pricey category are characterized by luxurious fabrics and a high level of handiwork, like perfectly finished seams and hundreds of delicate buttons. § If you are on a budget: There have never been better off-the-rack options. Hit the stores armed with your own “look book”, containing magazine tear-outs, photos from friends’ weddings, fabric swatches – anything that helps you communicate your taste to the sales staff. The more detailed, the better: “I like the neckline of this gown and the skirt of this one.” Be completely candid about your budget from the get-go. That way, you won’t waste a single moment trying on dresses that you’ll never end up buying. Brides comes in all shapes and sizes - and so should their dresses. Here's how to make sense of all the different styles and determine which gown will fit and flatter you most. look for: A skirt that gradually flares out in an “A” formation from the natural waist to the floor, highlighting the narrowness of the midsection and floating away from the hips and thighs. (Sturdier fabrics, such as duchesse satin and taffeta, are especially effective, since they won’t cling.) A spaghetti strap bodice or a V-neckline will also showcase a more slender upper body. keep in mind: A classic A-line silhouette lends itself to formal weddings, but it can also be dressed down when made from a more casual fabric, like eyelet lace or raw-silk shantung. keep in mind: Fabric on the bodice that has sheen to it (such as organza, satin, or silk) will add volume and call attention to your chest. Material that is pleated or gathered will have the same effect. look for: An Empire dress with a skirt that begins just under the bust and flows into a gradual floor-length A-line. Make sure the Empire seam does not start on the chest and that there is no pleating of the fabric, which is reminiscent of maternity wear. The dress should play up your shape, if it’s too loose, it will add pounds. keep in mind: Find fabrics like satin that provide structure, rather than anything too flowy. 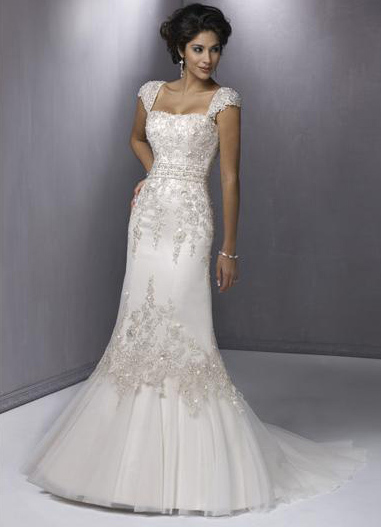 If you love the romantic look of airier fabrics, choose a gown with a stiffer base, then add an embroidered tulle overlay. look for: A dress that cinches in at the smallest point on the waistline, then flares out into a gradual A-shape. Opt for a bodice with a lot of texture to it – think ruche or lace detailing – that will camouflage and fit snugly, creating a corset-like effect. The most slenderizing neckline for you is one with a deep V, which will draw eyes toward the vertical, not the horizontal. look for: A simple silhouette. The strategy is to emphasize your natural shape, so every aspect of the dress – the lower waistline, a floor-sweeping hem – needs to reflect your longer proportions. If you’re wearing long sleeves, they should go past the wrist. You don’t want to look as if you’ve borrowed a gown from someone shorter than you. keep in mind: Because you are statuesque, you’ll want to err on the side of simplicity when it comes to embellishments. Too many bells and whistles, like ruffles and rosettes, can come off as cutesy, particularly on a tall person. look for: A dress that will create curves where you don’t have them. Try a sheath dress that’s cut on the bias. Or look for a ball gown that cinches in at your natural waist and descends into a full, flowing floor-length skirt: It will capitalize in your slenderness and camouflage a lack of hips. keep in mind: If you have a small bust, look for a bodice with some pleating to create volume. look for: A pleated bodice. Extra fabric up top will help fill out your upper body and create the illusion of curves. Lightly padded halter styles will also do the trick. keep in mind: The right bra will always provide a nice boost, but as many wedding dresses are strapless or backless, your undergarment may be fairly limited. Instead, try self-adhesive silicone bra cups. You’re never fully dressed without a few carefully selected accessories. Here’s how to put the finishing touches on your wedding day look. why choose it: You’re looking for extra coverage for a strapless gown or you just want an insurance policy against a chill. what to consider: Options range from the simple (a white pashmina or a cashmere cardigan) to the ornate ( a beaded wrap). You may want to wrap a satin gown in a panel made from the same fabric. Ask your dressmaker to order extra material from the same dye lot as your dress, as colors can vary slightly. Standard silk, chiffon, and lace wraps are sure bets too and with any luck, you’ll have an accessory you’ll actually wear again. why choose it: Many women don’t feel fully bridal without a veil, a tiara, or some other adornment. what to consider: If you go the veil route, try on a variety of lengths and shapes with your gown to see what complements it best. 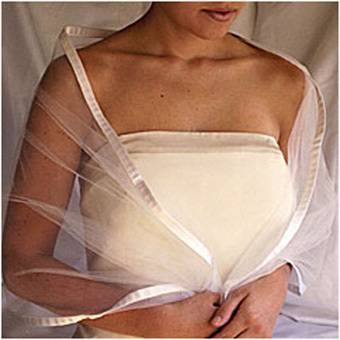 In general, longer veils are considered more formal and shorter ones have a slightly retro feel. 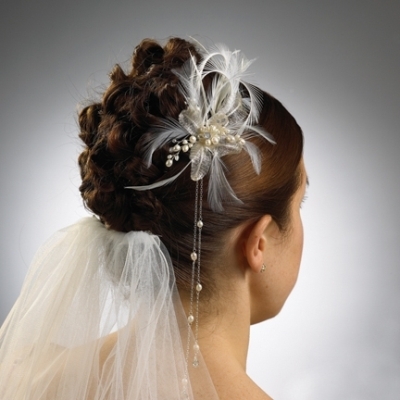 Tiaras, silk flowers, vintage combs, or pearl and crystal hairpins can also add a special touch. why choose it: To complement your neckline or simply to add sparkle to your Big Day. what to consider: You don’t want jewelry that steals the show. The pieces you purchase or borrow should enhance your gown, not compete with it. So if you’re wearing a dress with an elaborately beaded neckline, a necklace of any kind could be distracting. Diamond studs, pearl earrings or a delicate diamond bracelet would work well instead. On the other hand, a wide-set portrait neckline begs to be completed with a pendant or a pair of chandelier danglers. why choose them: Unless your ceremony involves sand, you can’t exactly go barefoot. what to consider: Heel height. Ballet flats or kitten heels are the safest call, but higher heels can also be comfortable if you choose a platform heel. Dyeing shoes the same color as your gown is the easiest way to guarantee a match but you can also try buying a metallic pair. Ivory dresses tend to go well with gold shades; truer white work better with silver tones.